I'm not sure if my progress has slowed on this, or if its just that it takes longer to go around now..........still loving the colour changes and I think I will aim for blanket size, rather than just cushion size. The answer is probably to do it alongside other projects and say to myself there is no rush....as I've said before, I'm not a long-haul kinda gal, but I think this one may be worth it, as it's rather lovely. So to keep me going, I decided to make a little birthday gift for my niece who will be two next week....can you guess what it is yet? She is a massive Peppa Pig fan so this was an obvious present! I was a little disappointed with the patterns I found on ravelry, so decided to give it a whirl myself, and I'm really pleased with the results....I can't help looking at it and laughing! When I get back this evening, I am looking forward to sitting down with my Sunday night cuppa and catching up with everyone else....until then....hope you have a great week! Oh, love the Peppa! And your knitting project reminds me of a beautiful Nautilus shell. :) Maybe they will make a balloon goat! Love the blanket and I'd say its just taking longer to go round, my pinwheel is like that at the moment and I think its just the going round bit thats taking forever!! Well my two year old recognised Peppa Pig and thinks she's great so I'd say youve got a winner there, enjoy your party and I hope you get an animal lol. That is how I keep my long haul projects. Just pick it up here and there and telling myself there is no rush. Otherwise it turns into an obligation and that is not a beautiful piece should feel like. I LOVE the Peppa Pig!! You did so well!! I am sure your niece will love it. The ten stitch twist is looking wonderful, very eye catching effect and lovely colours changes in the yarn. Your ten-stitch looks like a very beautiful fossil (ammonite?) Your Peppa Pig is just awesome, I have a little girl who would be most impressed but luckily for me she is asleep right now. Hope you had a great time at the party! Big is sooooo cute. And your ten stitch is awesome. Agree doing it in-between is the way to go. Just made that decision myself on my ghan that's going and going and going. I'm afraid I had to google "Peppa Pig" to find the reference, but now I can really see what a great job you've done! Adorable and so thoughtful! 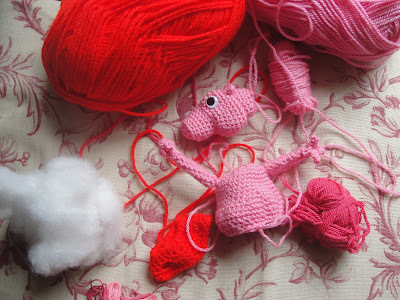 Peppa was a great break from the 10 stitch twist - which, btw, is looking fantastic!!! You know how much I love your ten stitch! I'm making my list for next year and it's on it! LOL! Love the yarn you're using too. That little Peppa is the cutest thing ever! You DID do a great job and how talented are you to make up your own pattern...that's amazing...I could not do that...now...maybe someday especially if I keep hanging out with all you talented people! Have fun tonight! TTYL! That ten-stitch is quite stunning. Wonderful yarn! Wow! I LOVE that ten stitch twist- it will make a really lovely blanket. I used King Cole Riot for a scarf and the colours were amazing. Your Peppa Pig is a work of genius, I tell you. Am hiding this from the little one, otherwise she'll want one too! Enjoy all the mad kid's parties! Your pig is SOOOOO cute! What a wonderful gift. The ten stitch is lovely - I agree that breaking it up with some small projects in between will help. That is going to be perhaps the loveliest blanket on the planet! Peppa is adorable, too! Your Peppa Pig is perfect!! You really are very clever, it looks like its pattern perfect!! I love your Ten stitch twist, the colours blend beautifully and it will be a stunning blanket! What a sweet Peppa Pig for your niece. She's gonna adore it! 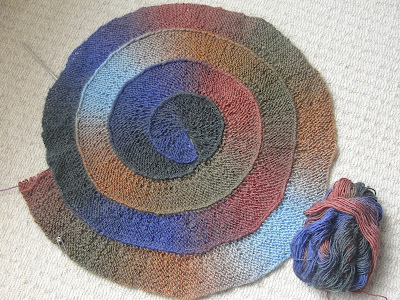 That neat, twisting swirl blanket is coming along nicely. Your ten stitch is beautiful, I love those colours and the way they merge so easily. Peppa is a cutie, too, she will be treasured I am sure. What an adorable little piggy - and such a good way to break up a big project. It always feels nice to be able to finish so I always mix little things in! The colors in the ten stitch are really lovely! love Peppa, hiding this post from Livy as she will demand one if she sees it. I'm loving your ten stitch twist. The yarn is amazing! She's so cute, well done you! Oh how I wish I could crochet, I'd be pestering you for the pattern as the girls across the road are huge Peppa Pig fans. Your Peppa Pig is Perfect :D So cute, and I'm sure will be well-loved. Hope the party was fun and that you weren't too worn out - children's parties are so tiring for grown ups! Ooh Peppa Pig, my goddaughter would love that! If you've ever seen it, I can't help feeling sorry for George though, he gets so bullied. Hey Faith, love your rug.....never seen one like this before. It will definitely be worth the effort and the yarn you are using is beautiful. Peppa Pig is a little cutie too.....your niece is going to love her pressie.